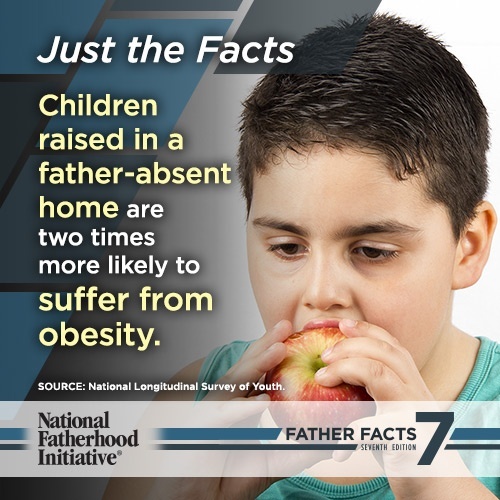 There is a father absence crisis in America. 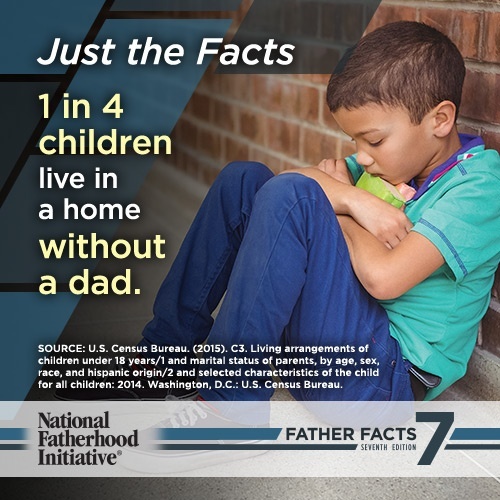 According to the U.S. Census Bureau, 19.7 million children, more than 1 in 4, live without a father in the home. 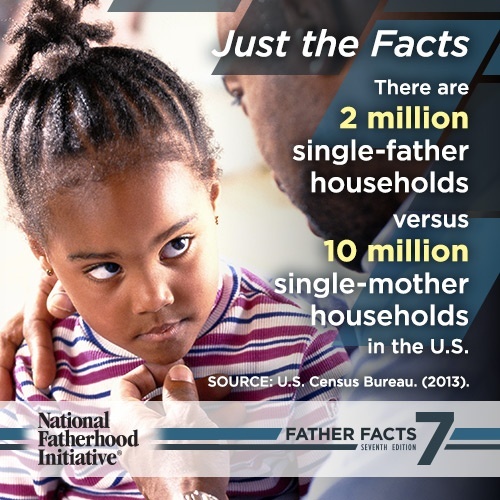 Consequently, there is a father factor in nearly all social ills facing America today. Download & Share to Help Spread the Word! Many people believe that family structure doesn’t really matter, as long as children are cared for and loved by someone, anyone. 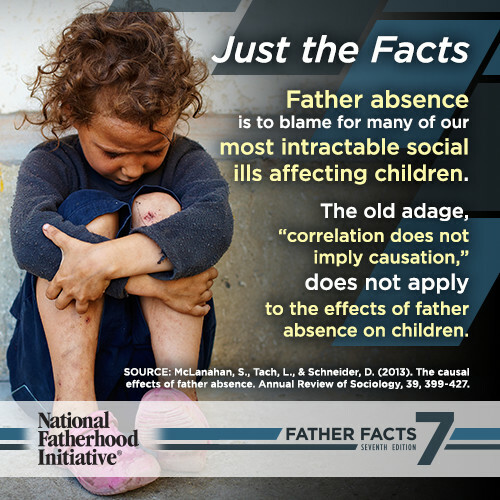 However, new research on father absence shows that old adage, “correlation does not imply causation,” does not apply to the effects of father absence on children. 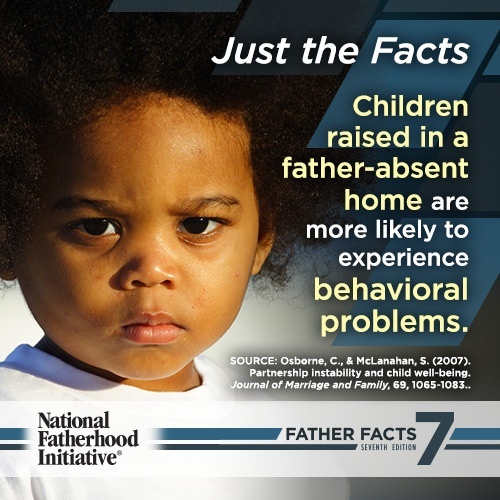 In other words, according to absent father statistics, for many of our most intractable social ills affecting children, father absence is to blame. Source: McLanahan, S., Tach, L., & Schneider, D. (2013). The causal effects of father absence. Annual Review of Sociology, 39, 399-427. 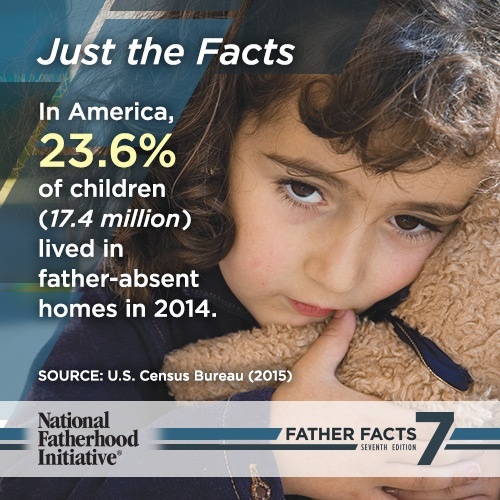 In America, 23.6% of children lived in father-absent homes in 2014. Consequently, there is a “father factor” in nearly all of the societal issues facing America today. 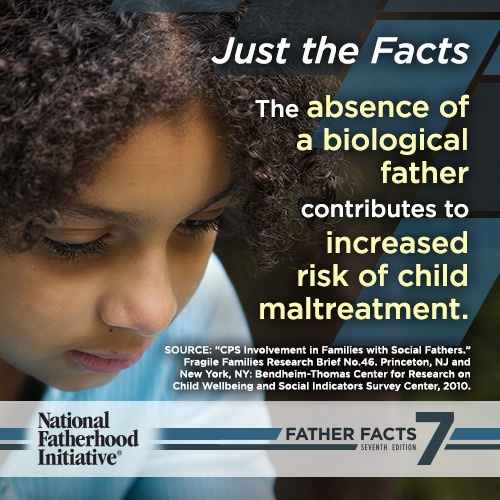 We must realize there is a father absence crisis in America and begin to raise more involved, responsible, and committed fathers. Source: U.S. Census Bureau (2015). 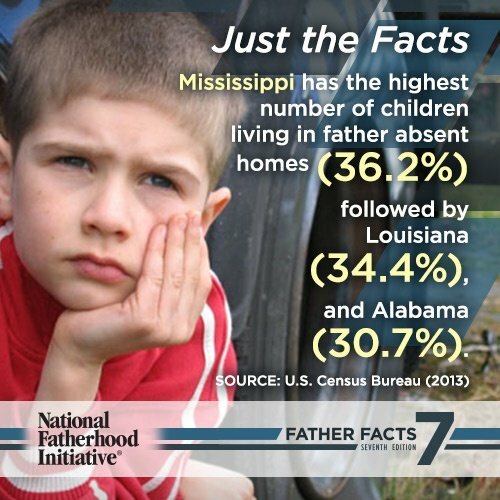 Mississippi has the highest number of children living in father absent homes (36.2%) followed by Louisiana (34.4%) and Alabama (30.7%). 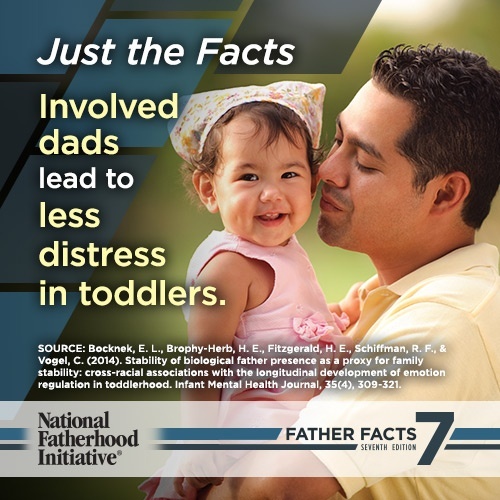 The three states with the lowest rates of father absence are...Utah (11.5%), North Dakota (14.4%), and Idaho (16%). Source: U.S. Census Bureau (2013). In 2011, children living in female-headed homes with no spouse present had a poverty rate of 47.6%. This is over four times the rate for children living in married couple families. 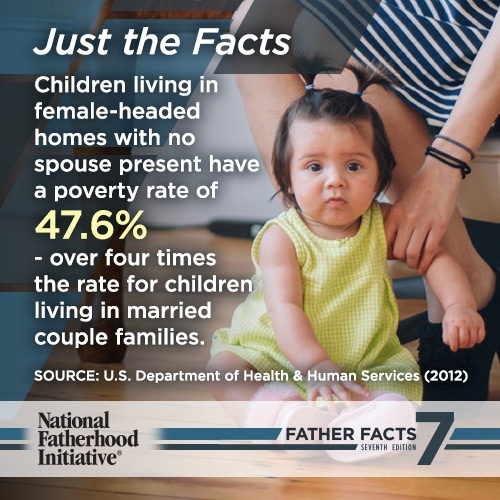 Additionally, Children living in female-headed homes with no spouse present have a poverty rate of 47.6% - over four times the rate of children living in married couple families. Even after controlling for community context, there is significantly more drug use among children who do not live with their mother and father. 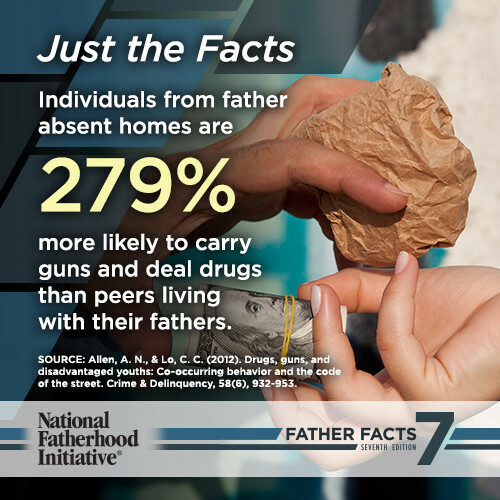 Additionally, individuals from father-absent homes are 279% more likely to carry guns and deal drugs than peers living with their fathers. Source: Allen, A.N., & Lo, C.C. (2012). Drugs, guns, and disadvantaged youths: Co-occuring behavior and the code of the street. Crime & Delinquency, 58, 932-953. 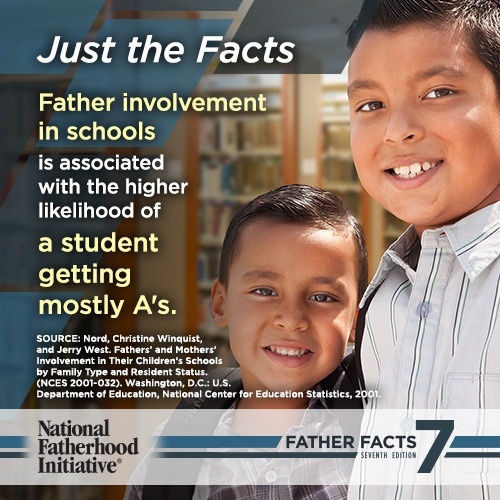 Father involvement in schools is associated with the higher likelihood of a student getting mostly A's. This was true for fathers in biological parent families, for stepfathers, and for fathers heading single-parent families. Additionally, students living in father-absent homes are twice as likely to repeat a grade in school. Data from three waves of the Fragile Families Study (N= 2,111) was used to examine the prevalence and effects of mothers’ relationship changes between birth and age 3 on their children’s well-being. Additionally, children born to single mothers show higher levels of aggressive behavior than children born to married mothers. Living in a single-mother household is equivalent to experiencing 5.25 partnership transitions. A study of 109 juvenile offenders indicated that family structure significantly predicts delinquency. 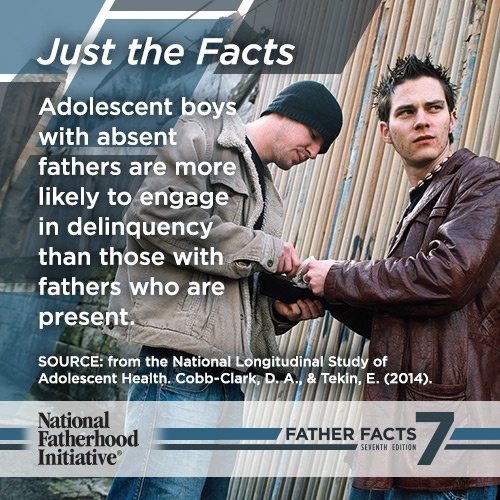 Additionally, adolescent boys with absent fathers are more likely to engage in delinquency than those who are present. Source: from the National Longitudinal Study of Adolescent Health. Cobb-Clark, D.A., & Tekin, E. (2014). 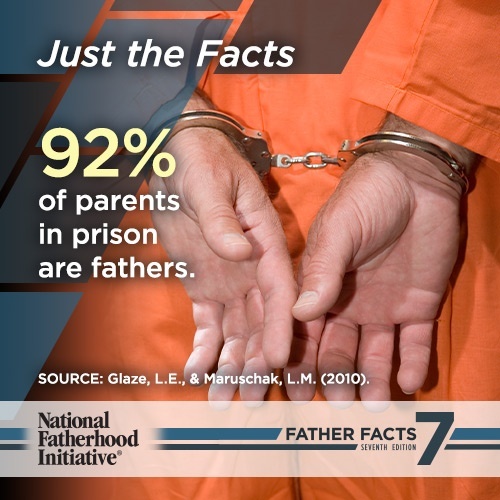 92% of parents in prison are fathers, and between 1991 and 2007 the number of children with an incarcerated father grew 79%. Even after controlling for income, youths in father-absent households still had significantly higher odds of incarceration than those in mother-father families. Youths who never had a father in the household experienced the highest odds. Source: Harper, Cynthia C. & Sara S. McLanahan. “Father Absence and Youth Incarceration.” Journal of Research on Adolescence 14 (September 2004): 369-397. Source: Glaze, L.E., & Maruschak, L.M. (2010). Parents in prison and their minor children. Washtington, D.C.: Bureau of Justice Statistics. Infant mortality rates are 1.8 times higher for infants of unmarried mothers than for married mothers. 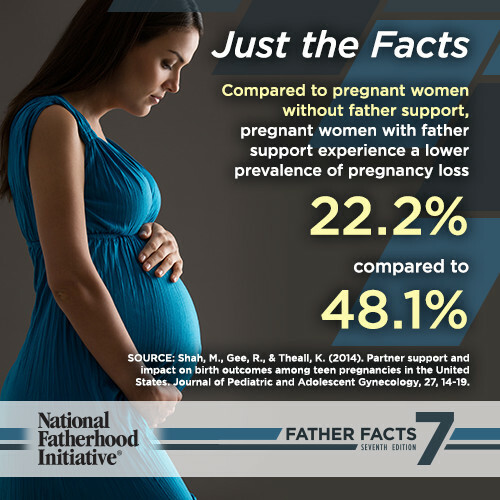 Compared to pregnant women without father support, pregnant women with father support experience a lower prevalence of pregnancy loss 22.2% compared to 48.1%. 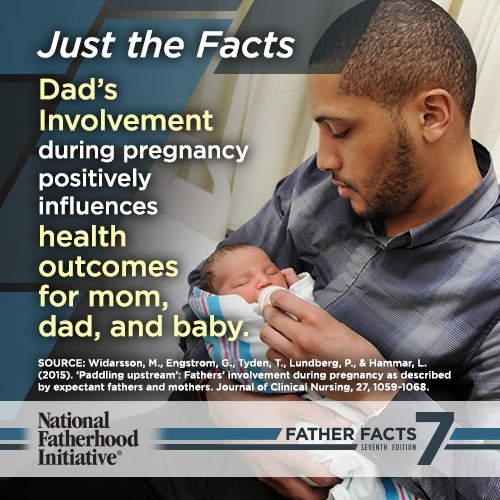 Allowing new fathers to be involved in caring for their child in the first days of a child's life can have positive long-term benefits. Source: Shah, M., Gee, R., & Theall, K. (2014). Partner support and impact on birth outcomes among teen pregnancies in the United States. Journal of Pediatric and Adolescent Gynecology, 27, 14-19. Source: Anthes, E. (2010, May/June). Family guy. Scientific American Mind. Source: National Longitudinal Survey of Youth. Additionally, adolescents in single-mother and single-father families are at higher risk of risky behaviors, victimization, and mental distress compared to those in two-parent families. Being raised by a single mother raises the risk of teen pregnancy, marrying with less than a high school degree, and forming a marriage where both partners have less than a high school degree. However, higher quality father-daughter relationships are a protective factor against engagement in risky sexual behaviors. Source: Jablonska, B., & Lindberg, L. (2007). Risk behaviours, victimization and mental distress among adolescents in different family structures. Social Psychiatry & Psychiatric Epidemiology, 42, 656-663. Source: Ellis, B.J., Schlomer, G.L., Tilley, E.H., & Butler, E.A. (2012).